See in Glossary Window displays several fields. These fields allow you to specify the name of the function you want to call, and the value of the parameter you want to pass to it. See in Glossary > Cube). 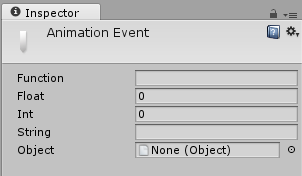 To add your new script file to it, drag and drop it from the Project window into the Inspector window. See in Glossary > Animation or use ctrl+6). Set a Position curve for the x coordinate.